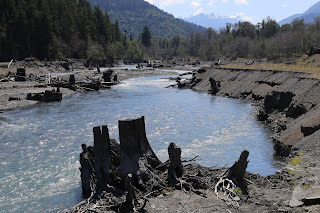 This was the site of Lake Aldwell, impounded by the Elwha Dam which was removed in 2012. It has since turned back into a glacial fed river, working through a large volume of sediment that accumulated in the century the dam was in operation. The stumps were originally logged in the 1910s, and like many stumps of primary forest have springboard notches showing their method of harvesting.